We always keep a supply of romaine lettuce in the fridge, since it is one of the low-calorie snacks that calms down our crazy beagle when he’s on a barking tirade. This week, I decided I wanted to get to the lettuce before he ate it all up, so I came up with this simple stir-fry and served it on whole leaves. They’re sturdy enough that you can eat them taco style, but you can also make more delicate wraps with red leaf or butter lettuce if you prefer. If you have difficulty tracking down wood ear or shiitake mushrooms in their fresh form, you can find them sold dried online (this packet will last you quite a while! ), or at any Chinese grocery store. Just rehydrate them in warm water for an hour or so, until they are soft and pliable through and through. Oh, and this stir-fry is super-versatile, too. If you’d like to serve it as a more filling main dish, spoon a cup or so over a bowl of soba noodles or brown rice. 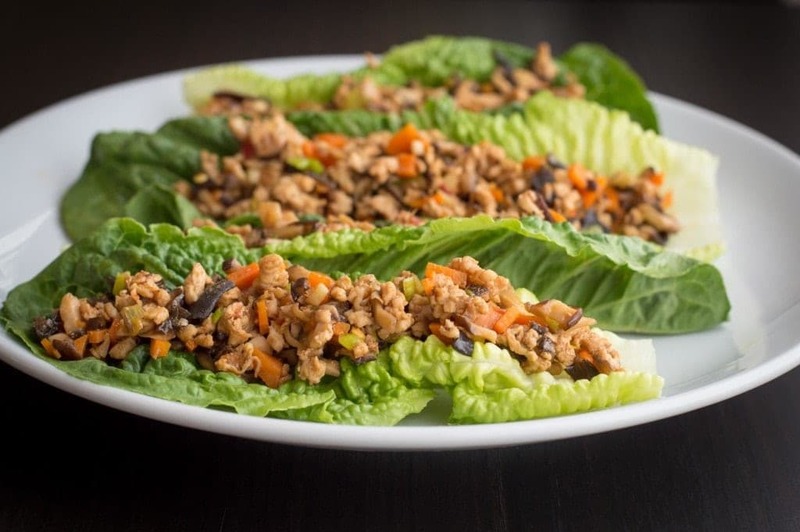 Crunchy romaine lettuce leaves are filled with a spicy, savory mix of ground turkey, mushrooms, and diced vegetables. In a small mixing bowl, whisk together all of the sauce ingredients and set aside. In a large (12-inch) skillet, heat one tablespoon of the canola oil over medium heat. Add the garlic and sauté until aromatic, about one minute. Add the carrots and sauté until slightly softened, about five minutes. Add the shiitake and wood ear mushrooms and sauté until mushrooms have shrunken considerably, about 15 minutes. Don’t worry if some golden browned bits are beginning to stick to the skillet — the sauce will help you scrape those up later. Scoot the sautéed vegetables to the edges of the skillet. Add the remaining tablespoon of canola oil to the skillet, then add the ground turkey breast on top of the oil, breaking it up with a spatula. Sauté the turkey until it is completely cooked through, continuing to break it up as it browns, about 10 minutes. Add the reserved sauce and green onions to the skillet. Stir everything together until the turkey and vegetables are thoroughly mixed and coated evenly with sauce. 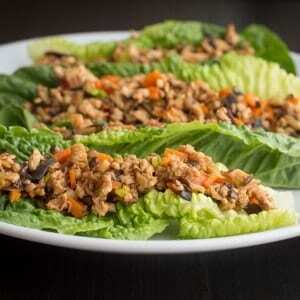 Spoon onto lettuce leaves and serve immediately. 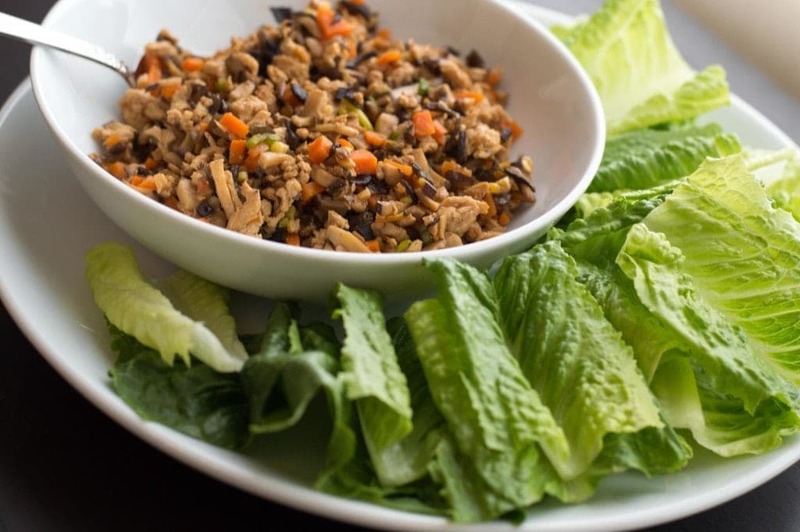 Alternately, you can serve bowls of the stir-fry with lettuce leaves alongside for your guests to assemble.